Hey Friends MyTricksTime find a mobikwik loot deal again for you. 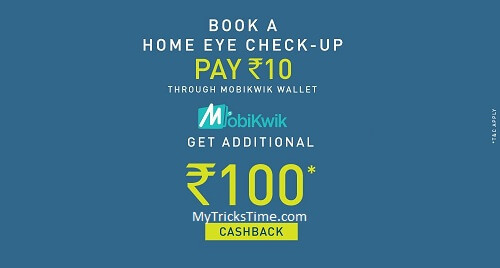 in this you will get flat Rs.100 cash back by paying just Rs.10 via your mobikwik wallet, so have a look about this offer, So guys now Get LensKart Home Eye Check up by paying just Rs.10 using your Mobikwik wallet and get Rs.100 Mobikwik money cashback. Login or signup or checkout as a guest. Read and follow terms and conditions to get cashback. Payment made through Mobikwik Wallet. Cities where Home EyeCheck is available are Delhi and NCR, Bangalore, Mumbai, Chennai, Kolkata, Pune, Hyderabad.